John Gable has created murals and paintings for public and corporate accounts throughout his career. His commissions have included portrait work for the Smithsonian Institution, historic paintings in the Willard Continental Hotel in Washington and murals for high-end restaurant groups. Centre St Arts Gallery is pleased to have Jack as a member and to share images of his latest commissioned mural. 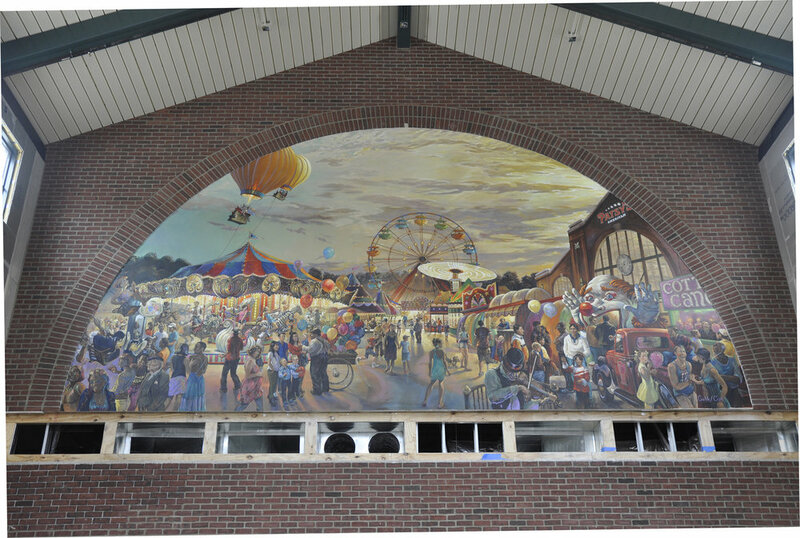 Christopher Cart, muralist and painter, assisted John with this project. 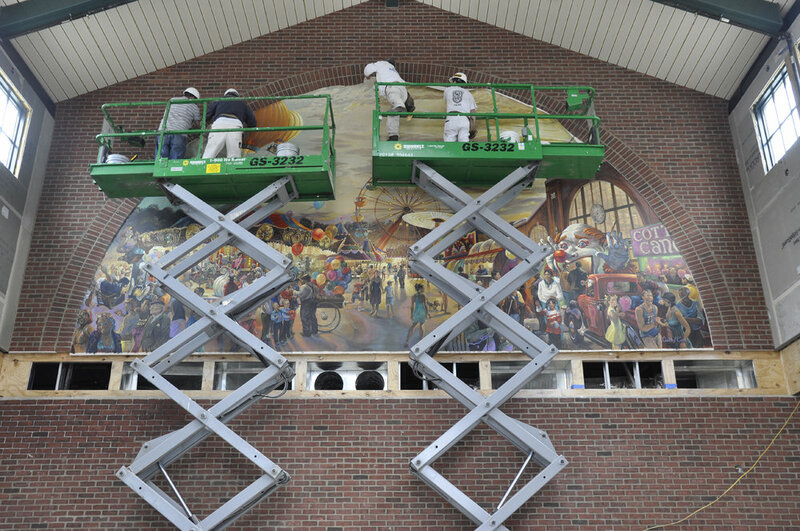 Chris is known for murals he created in Bath, Brunswick and Hallowell. 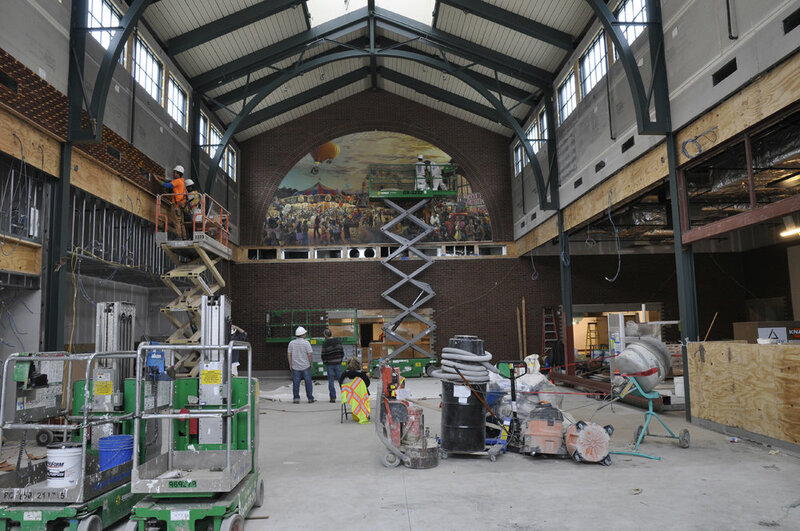 This project, commissioned by a client in Tyson, Virginia, includes two 15 by 30’ murals and five 6’ paintings. The murals were are designed to give the perception of a stained class window. A carnival scene employing vivid color, plentiful detail and theatrical drama was created to achieve the client’s desire and to reflect high drama. One of the 15 feet by 30 feet murals. These murals grace the ends of a newly constructed 25,000 building. The acrylic on canvas murals were created in John’s Bath, Me studio. For ease and installation each mural was created in two sections. This type of installation is more convenient for both artist and client than painting on site. It takes a team to hang and adhere these murals! Almost done! John and Christopher at work. A close up of the vivid details. John in front of one of the murals.